It will be easy to figure out which star will be the Christmas Star this holiday season. A few weeks before or after Christmas Eve simply stand facing south and look nearly straight up around midnight for a ruddy orange star that will shine brighter than any other. This star is actually Mars. After nearly a two year hiatus, it will return to the eastern evening sky for another decent opposition on December 24, which means it will be up all night, but due to its highly elliptical orbit, it will be at its closest, largest, and brightest on December 18. On that date Mars will be 54.6 million miles from Earth and 15.9 arcseconds across. It will shine at a demanding magnitude of -1.7. Even though this is not as good as past oppositions, Mars will still reign over the dark skies of the long winter nights. 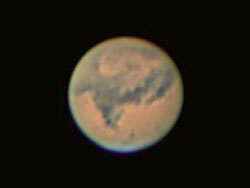 Mars is interesting to observe because it is the only planet that clearly displays a solid surface. It is a rusty desert world of windswept sand dunes, towering volcanoes, gaping canyons, craters, and two polar ice caps. These polar ice caps are the easiest to see and are composed of water and carbon dioxide. During this opposition both polar ice caps will be equally visible as it will be spring in Mars’ northern hemisphere, but the northern ice cap may be larger as it has just emerged from winter and has yet to begin melting, while the southern ice cap is experiencing autumn and has already shrunk from a summer of melting. Several of the dark and bright features that have become familiar during prior oppositions will return provided there are no dust storms raging across the planet at the time. The darker, brownish areas are primarily dust-free outcrops with the largest and darkest being a wedge called Syrtis Major. Sinus Meridiani (Meridiani Planum) is where the Opportunity Rover landed in January 2004. Solis Lacus is another prominent dark feature that looks like an eye and is often nicknamed the “Eye of Mars”. Hellas is a deep impact basin over 1000 miles across that is filled with very fine, highly reflective dust that can be confused for clouds or the south polar ice cap. Mars demands extreme patience when it comes to observing; several nights of observing will train the eye to focus on details. Larger telescopes will improve the view along with the use of orange or red filters. The features are usually subtle, but Mars will be very high in the sky near the Gemini-Taurus border and therefore turbulence will be less. The first row of diagrams above show a complete surface map of Mars with the most prominent features visible as well as the polar ice caps. Three different global views follow with the darkest and most prominent surface features shown. The dates in the third row indicate when these features will be nearly centered on Mars at 11PM EDT (10PM EST). These views are good for a few hours either way or a few days around the given dates. 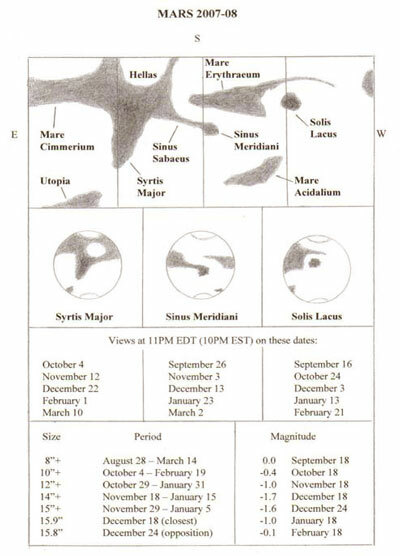 Since Mars rotates on its axis in 24 hours and 37 minutes, these features will shift throughout the night. The rotation rate from Syrtis Major to Sinus Meridiani is six hours. From Sinus Meridiani to Solis Lacus is another six hours. If Solis Lacus is visible, then it will be another twelve hours before Syrtis Major returns to view. The fourth row indicates the change in size and brightness for Mars during this apparition. The best time to observe Mars is when it is larger than 10 arcseconds across. This will occur from October 4 through February 19, which will provide a reasonable period of time to train the eye enough to make sketches and also to take photos and video. The retrograde path of Mars among the stars from November until February can also be observed and plotted. Take note of the changing phases of Mars as it becomes noticeably gibbous by February with only 90% of its disc being lit by the Sun as seen from Earth. Due to its very elliptical orbit, not all oppositions of Mars are good. This one is about average, but the oppositions in 2010 and 2012 will be worse before growing better in 2014 and 2016. The best opposition ahead will be on July 27, 2018 when it will be 24.3 arcseconds across. 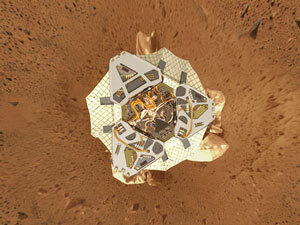 These next eleven years will undoubtedly be an awesome era of Martian exploration with endless discoveries. Observing and recording Mars during this holiday season will reward you with the unique personal gift of self satisfaction.